A unique Feeding bottle range that follows baby's growth in the most natural way. 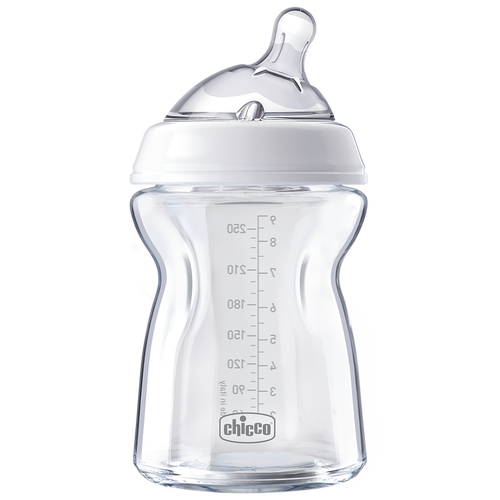 The Chicco Natural Glass Baby Bottle has a Twin Anti-colic valve to prevent air ingestion, reducing the risk of colic. It's extra soft silicone teat is as natural as mother's breast. The one and only inclined teat: Always full of milk, reduces any swallowing of air and encourages the correct neck position for newborns. Dual anti colic valve: prevents air from being swallowed, reducing the risk of colic, for calmer feeding. Extra soft silicone: Soft silicone and grooves at the base for a natural feeling like a mother’s breast.